Between 1E 453 and 1E 460, a cult of Hermaeus Mora formed under the leadership of High Priest Uluscant, who challenged King Dynar's rule. After being subject to strange visions and murder, the royal family was driven into exile. Around 2E 582, a conflict emerged between the Nereid-worshipping Rain Disciples and the Hermaeus Mora-venerating Primeval Seekers. The Nereid Lorelia wished to prevent Halcyon Lake from eventually desiccating, and to accomplish that she used her Rain Disciples' memories to create a water stone. The Primeval Seekers, on the other hand, tried to stop her and drive out the Rain Disciples from the ruins. It is unknown which side succeeded. 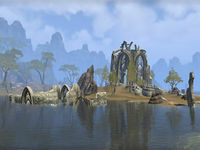 The Ayleid name translates to "New Water Halls".